A duck with a yymphony of favors specially crafted by Executive Sous Chef Kok Chee Kin’s at Dynasty Restaurant, a pork free restaurant in Renaissance Kuala Lumpur Hotel. 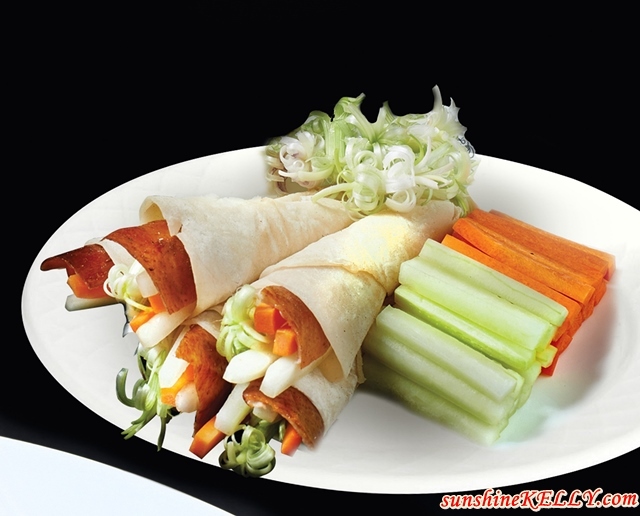 The award-winning Dynasty Restaurant is renowned for its Signature Peking Duck. Every Signature Peking Duck ordered is hand-carved at the dining table and the crispy skin is served with homemade pancake, scallion, cucumber, carrot and plum sauce. Meanwhile, the meat is taken back to kitchen and cooked according to your choice of preparation. We had the shredded duck with assorted mushrooms. The Signature Peking Duck is meticulously marinated with a combination of spices and Chinese herbs, they are roasted in a traditional charcoal-fired roasting oven. The roasting process takes about an hour, infusing into the bird with a delicious smoky aroma while keeping its skin scrumptiously crispy and the meat succulent. Available for dinner from 30 August to 30 September 2017 at RM60.60nett per bird, these delicious ducks are normally priced at RM168nett and are for dine-in only with an order of any main course or a side dish from the a la carte menu. Address: Corner of Jalan Sultan Ismail & Jalan Ampang, 50450 Kuala Lumpur, Malaysia.